Copyright International Ammunition Association, 2006. All rights reserved. 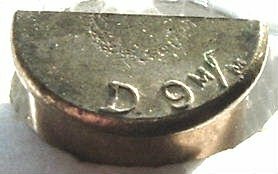 The Devisme cartridges were some of the earliest centerfire metric metallic rounds developed. They are inside primed. They were the idea of the 1860's Paris gunmaker, L.S. Devisme who designed a number of revolvers and developed the ammunition for them. Similar designs are also found in 7mm and 11mm calibers. This design achieved no commercial success outside of France and consequently the rounds are scarce. Note the construction of the priming system which consists of a copper cup containing the priming composition which is sandwiched between the brass case and an internal brass component which acts as the anvil and contains the flash hole. This makes them difficult to identify from rimfire cartridges when only looking at the exterior. References:	Erlmeier and Brandt, Manual of Pistol and Revolver Cartridges, E-B 119. NOTE: One visitor reported: "The cartridge posted is in fact a 9 mm Dumonthier used in walking sticks guns (cannes)and blowpipe guns (sarbacanes). This is an old mistake perpetuated by Erlmeier-Brandt." Copyright 2006 by the International Ammunition Association, Inc. All rights reserved.